The Bonbon Rouge lamp in heavy bottom weighted ruby glass appears round in our photograph but the lamp actually has four subtly shaped corners. A nice clean appearance and the rich color make this lamp a winner. 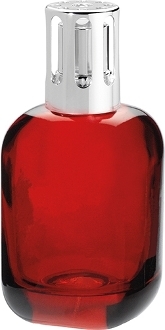 This lamp comes in a nice lampe Berger gift box with instructions, funnel, burner and both tops.